Eastern Kentucky Correctional Complex is located in West Liberty Kentucky, part of Morgan County. 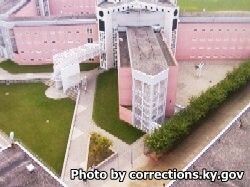 It is a medium security prison that also contains a stand alone minimum security unit. Inmates at this prison can receive anger management, treatment for drug and alcohol addiction, and a general life skills course. A pre-release program called 'Prison to Paycheck' prepares inmates for their release (6-12 months) by teaching the offender how to complete job resumes, job interviews, and job applications. Education is an important part of the rehabilitation process. Inmates housed at Eastern Kentucky Correctional Complex can take adult basic education courses, earn a GED, and learn to read. Technical/Vocational programs offer inmates certifications in Carpentry, HVAC, small engine repair, and masonry. General population inmates have visitation on Saturdays, Sundays, and Mondays in two sessions from 8:30am-11:20am and from 12:30pm-3pm. General population non-contact visits that occur on Saturdays and Sundays in two sessions from 8:30am-11:20am and from 12:30pm-3pm Administrative segregation and disciplinary segregation have visitation on Mondays from 8:30am-10:30am. Protective Custody inmates have Monday visitations from 12:30pm-2:30pm.